Zocho: What role did you play in the development of WARS? Kallenbach: I was involved with other studio projects when WARS was created, so I can't tell you how the basic concepts got going. It was my job to polish the "bible" for WARS that would be shown to other licensors and explain the universe and its characters. Of course, I designed many cards and wrote lore and stories for the property as well. Zocho: Who were the people who made up the setting? Kallenbach: Tim Ellington, Mike Stackpole, Tom Lischke, and Warren Holland were certainly involved before I got there. Zocho: What inspired the various factions? Kallenbach: Much of the faction selection had to do with look and feel. Each had to have its own visual style. The politics and motivations grew from that. 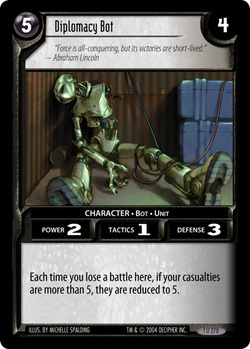 Zocho: Your short stories really captured the feel of the cartel- especially the character of the Diplomacy bot, whose card screamed for a story from that picture of it tossed in a corner with a broken arm. Did anything inspire the tales of him and Hotwire? Kallenbach: I wanted more stories with different points of view. I was truly inspired by that artwork, and I struggled with how to present that. Finally, I decided on the robot's point of view. Zocho: Another story that was truly striking was “Accord Negotiation,” the first (and only) time we got to see the lunacy of Raving Red Jane. What can you tell us about her character and her development? Kallenbach: Of course, RRJ was from Mike Stackpole's story. The artwork that we had for her was amazing. Again, I wondered what point of view to use for that story, and came up with the poor guy who had to work with her every day. That was by far my favorite WARS story. I tried to write the combat like a slow-motion Wild Bunch or Tarantino production. We had so many more plans for Janey! Zocho: What was it like collaborating with such a talented group of people like Kieran Yanner, Michael A. Stackpole, etc.? Kallenbach: Absolutely fantastic! Everyone that worked on this project was so passionate about it. We poured our hearts and souls into WARS. Zocho: Are there any stories about the production you’d like to tell? Kallenbach: I suppose it's known that many of the cards featured artwork based on photos of real people. That process was a lot of sun, and all kinds of folks were included. There was a big stack of props in a corner of the art department used for guns, wrenches, knives, whatever was necessary. Since this was Decipher's first original IP, I got to write art descriptions for cards for the first time. Seeing your words turned into an awesome painting is a great thrill. Zocho: What can you tell us about the unfinished sets of WARS such as “Edge of the Sword” “Motion of Mind” and “Eye of Insight”? Kallenbach: Edge of a Sword was near completion, and we really knocked ourselves out to make that the best we could be. It's a shame it never was published. I don't recall what the plans were for the other sets. 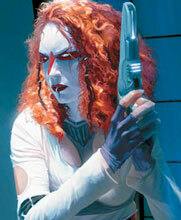 Zocho: The WARS tcg is of course based on the rules of the old Star Wars ccg, but the rules work much smoother. What refinement were you proudest of? Kallenbach: We strove to replace the old timing rules with a streamlined system familiar to players of other TCGs. We had some problems properly instituting this plan, but all in all, it improved the game. Zocho: Is there anything you would have done differently with WARS? Kallenbach: From a story/introduction perspective, I wish we had created a "dream team" of characters from varied factions and told their story as they explored the universe of WARS. That would have given players a point of reference that didn't change from story to story. Zocho: What do you think of the new Novella series? Kallenbach: I love the idea that other writers are continuing the stories we began to tell. Very exciting indeed! Zocho: Can you tell us a little bit about your career post-Decipher? Kallenbach: I've been creating TCGs for Sony Online Entertainment, including Legends of Norrath (based on the EverQuest MMO) and Star Wars Galaxies (based on the MMO of the same name). Card Commander is our Clone Wars game, and we've done a couple of games based on the SOE Free Realms MMO. Zocho: What is your favorite faction? Kallenbach: I'll follow Raving Red Jane wherever she goes! Zocho: What is your favorite aspect of the WARS universe? Kallenbach: I love the setting. It's this solar system... that's it. No "planet of the week." Develop every nook and cranny of that setting until it's rich and fully fleshed out. That's so much better than planet hopping from one stereotype to another. Zocho: Are you excited to see the property making a comeback? Kallenbach: Certainly! WARS was designed from the beginning to be a property with "legs," so that it could be expanded and developed for all kinds of formats and platforms. Zocho: Which conflict did you most intriguing: the three-way human conflict or the two-way Quay/Shi conflict? Kallenbach: I think things are a little more complicated than that, but I prefer the stories about humans rather than those alien interlopers. Although I loved writing the story about the Shi commander who missed his home and family. Zocho: Decipher's loss of the Star Wars card game license: Blessing in disguise or still overall a negative for Decipher as a business entity? Kallenbach: I remember a similar discussion about Joss Whedon's properties: "If Firefly had been canceled, we would have never had Dollhouse!" To which I answered, "I'll take more Firefly, please." Who could have imagined that Star Wars would still be going strong after all this time? Zocho: What considerations drove the question of which humans to make Kizen or to leave "powerless" from a Kizen ability standpoint? Kallenbach: The important aspect was to make Kizen relatively rare. The possibility of someone becoming a Kizen (or losing their abilities) is always interesting as well. Zocho: Thank you for taking the time to talk to us Mr. Kallbach! We really appreciate the insight on the early days of WARS, and wish you luck in your future pursuits. The new WARS Tradepaperback WARS: The Battle of Phobos Preludes Is available now from Amazon.com and Barnes and Nobles.com! Click the link below to find out where to buy it.